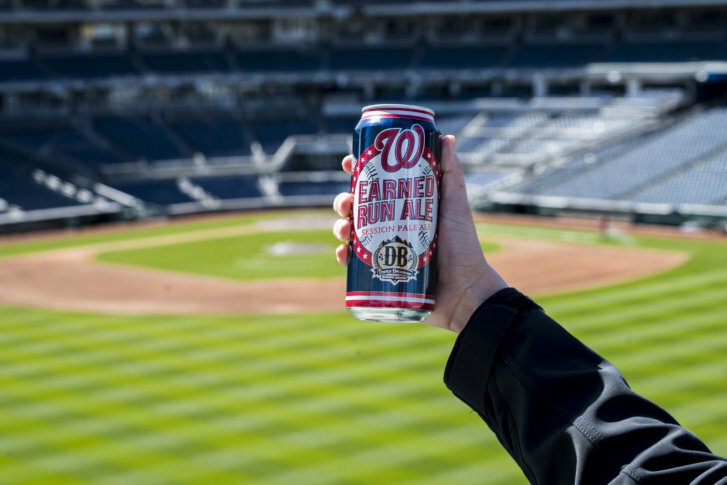 Lexington, Virginia-based craft brewer Devils Backbone debuted Earned Run Ale as a draft at its Left Field Lounge bar at Nationals Park last year. Now it is bringing Earned Run Ale back, this time in cans, and available at retailers. WASHINGTON — Lexington, Virginia-based craft brewer Devils Backbone is bringing back its Earned Run Ale, this time in cans and available at retailers. Devils Backbone debuted Earned Run Ale as a draft at its Left Field Lounge bar at Nationals Park last year. This time, the Golden Pale Ale is being sold in cans at retail stores across the D.C. area. The 16-ounce cans of Earned Run Ale are being sold in four-packs. Earned Run Ale is made with Maris Otter, Pale Ale and Torrified wheat malts, Bravo, Citra, Amarillo and Centennial hops and has an alcohol content of 4.2 percent. It is the only Virginia craft beer brewed for the Washington Nationals. Devils Backbone will also serve it again this season at its ballpark lounge, in Section 301 at Nats Park, along with its other beers on tap, including Vienna Lager and Eight Point IPA. Devils Backbone was acquired by Anheuser-Busch InBev in 2016, although the 10-year-old brewer continues to operate as an independent craft brewer as part of AB InBev’s craft beer division called The High End. Other The High End beers include Shock Top, Goose Island and Blue Point. Devils Backbone’s Outpost Brewery & Taproom in Lexington is the primary production brewery. Its Basecamp Brewpub & Meadows, in Roseland, Virginia, includes 100 acres surrounded by the Blue Ridge Mountains. The two locations host more than 500,000 guests annually.